Having just spent a weekend with my wife Gill down in our caravan on the Gower peninsular in South West Wales, I was reminded that the caravan is my favourite writing spot and that my latest book has now been published. 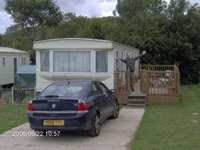 I love going to the caravan in Llanrhidian, and find it's a place I can write easily and peacefully. 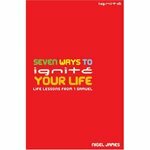 The new book, which is the fourth in the Ignite series, is called "Seven Ways to Ignite your Life- Life Lessons from1 Samuel. It's the first time I've concentrated purely on teaching from one book of the Bible, and I've used incidents from the lives of Samuel and David to draw out some practical guidelines for everyday living. Saul and Jonathan get a mention too, and my friend Andy Booth from Heartland Church in Fort Wayne, Indiana, has contributed some special features. The book started life as a series of devotions on our Ignite UK tour back in 2001 and I've also used the themes on the road with Third Day and as leadership lessons for the young leaders at the Flames of Fire conference in Mid-Wales one year, as well as teaching some of the chapters in various places around Cardiff. Often, by the time I've written a book I've lost some interest in it, or I've moved onto a new book, but I'm still excited about this one. Despite being immersed in writing a book about travelling as Third Day's road pastor (I promise I'll tell you more about this project soon) I think I'll be using some of the teaching from 'Seven Ways to Ignite your Life' for a good while. Hope you get to read it- if you do then give me some feedback.